The Library of Virginia has online images from the “Confederate Disability Applications and Receipts” collection. These applications result from an 1884 act to grant a total of $60,000 to veterans (soldiers and sailors) who had been disabled in the Civil War. This entry was posted in Uncategorized on February 23, 2016 by mjnrootdig. 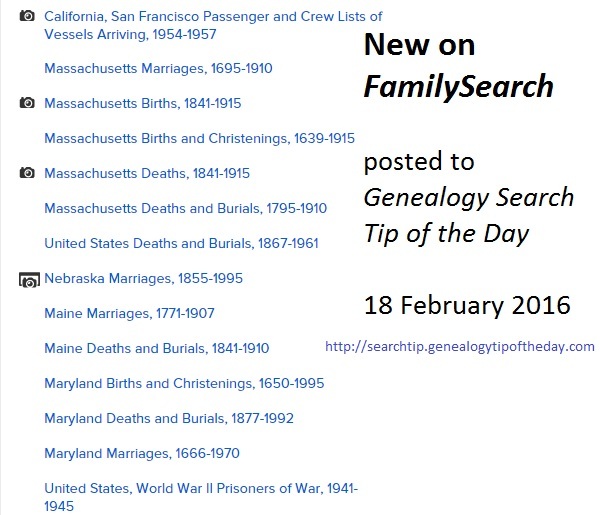 Genealogy Search Tip of the Day is proudly sponsored by GenealogyBank. In February, they are offering an annual subscription for a monthly rate equivalent to less than $5 a month! This entry was posted in Uncategorized on February 22, 2016 by mjnrootdig. 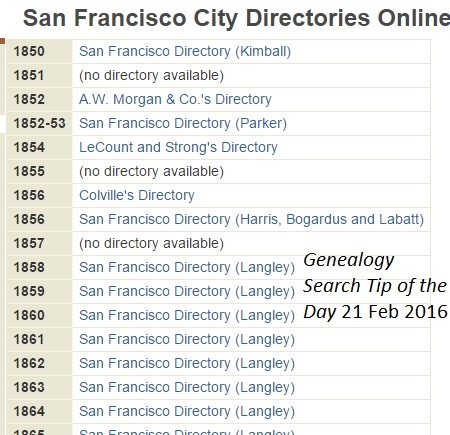 This page on the San Francisco Public Library website has links to free copies of San Francisco between 1850 and 1982 . This entry was posted in Uncategorized on February 21, 2016 by mjnrootdig. My blog update is sent every week and summarizes content posted to all my blogs since the last update was sent. 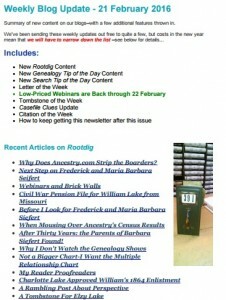 Some use the weekly update in place of the daily updates that go out. There’s a nominal $5 fee per year to pay for the email service that is used to send the update out. Email addresses are not sold or shared. You can view the most recent issue where there is also a subscription link at the bottom of the page. This entry was posted in Uncategorized on February 20, 2016 by mjnrootdig. The Indiana University website has a collection that consists of all published Indianapolis city directories ranging from 1855-2001. 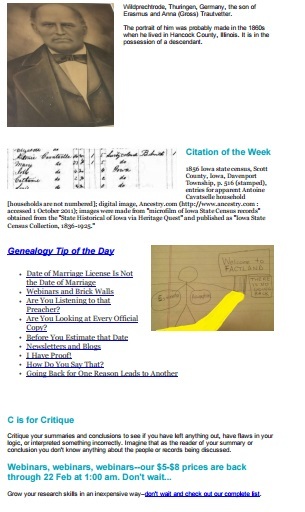 FamilySearch has added 14 rolls of microfilm to it’s online collection. 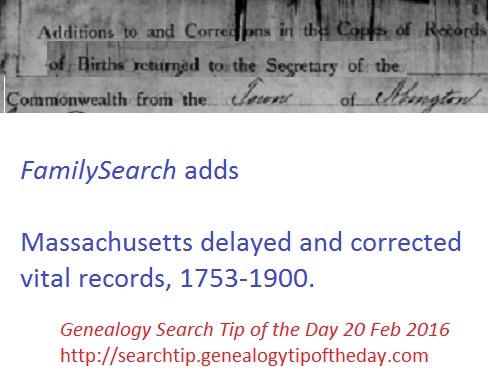 Massachusetts delayed and corrected vital records, 1753-1900. This entry was posted in Uncategorized and tagged familysearch us on February 20, 2016 by mjnrootdig. Brooklyn, New York, city directories covering the years 1856-1908 have been digitized by Brooklyn Public Library and can be viewed on their site. This entry was posted in Uncategorized on February 19, 2016 by mjnrootdig. Old prices back (an average of $8–lower than the competition!) between 18 February and 21 February Regular prices are between $15 and $20. From now through 21 February, we’re also offering all four of my “Brick Walls from A to Z” webinars for a total of $15.. This entry was posted in Uncategorized and tagged familysearch us on February 18, 2016 by mjnrootdig.